Back cover blurb: When single mum Joanna hears a rumour at the school gates, she never intends to pass it on. But one casual comment leads to another and now there’s no going back . . . Rumour has it that a notorious child killer is living under a new identity, in their sleepy little town of Flinstead-on-Sea. Sally McGowan was just ten years old when she stabbed little Robbie Harris to death forty-eight years ago – no photos of her exist since her release as a young woman. So who is the supposedly reformed killer who now lives among them? How dangerous can one rumour become? And how far will Joanna go to protect her loved ones from harm, when she realises what it is she’s unleashed? When Joanna Critchley hears a rumour at the school gates, she dismisses it as idle gossip. The sort that she wouldn’t usually associate herself with. But Joanna has only recently returned to Flinstead after moving back from London, and her son Alfie is struggling to make friends at school. If Joanna can get in with 'in crowd' of Mum's at school, then Alfie will have invitations to parties galore, and instantly become more popular. Joanna should hate herself for what she is about to do, but she is desperate, and desperate people do desperate things ... particularly for the ones that they love. Sally McGowan, was ten years old when she stabbed five year old Robbie Harris to death. She claimed it was an accident, but the jury didn’t believe her, and she has faced public judgement and persecution ever since. Speculation has always been rife about where Sally might be residing in the present day, and what kind of person she is now. The latest rumour is that she is living in Flinstead, and it’s a rumour that doesn’t sit well with the locals. I can’t say too much more as I don’t want to give anything away. But this book will definitely make you think the next time you hear a bit of ‘juicy’ gossip. 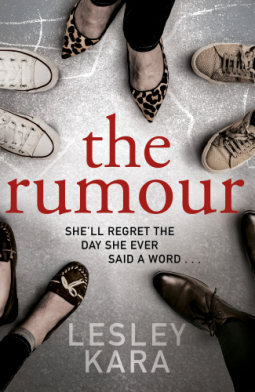 The Rumour is available now via Amazon online and all good book shops.